* Don't all religions lead to God? * Isn't it enough for a person to be sincere? * What happens to those people who haven't heard about Jesus? 1 Don't all religions teach the same basic beliefs? 2 What's so unique about Christianity? 3 Isn't it enough for a person to be sincere? 4 Aren't Mormons and Jehovah's Witnesses Christians? 5 Can't a person get to heaven without Jesus? 6 What about people who haven't heard of Jesus? About "Contender's: How is Christianity Different From Other Religions? 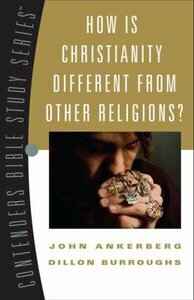 (Contenders Bible Study Series)"
Dr. John Ankerberg is host of the award-winning apologetics TV and radio program The John Ankerberg Show, which is broadcast in more than 185 countries. Founder and president of the Ankerberg Theological Research Institute, John has authored more than 60 books, including the bestselling Facts On Apologetics Series with over 1.5 million copies in print, and other substantial titles such as What's The Big Deal About Jesus? ; The Da Vinci Code Controversy; and Defending Your Faith. Dillon Burroughs is a graduate of Dallas Theological Seminary and author or coauthor of nearly 30 books on issues of faith and culture, including Defending the Faith, What's the Big Deal About Jesus? and Comparing Christianity with World Religions. He has served among at-risk American youth, constructed housing in Mexico's barrios, provided aid relief in Haiti, and was most recently nominated for a CNN Hero award for his efforts to fight human trafficking. Dillon lives in Tennessee with his wife, Deborah, and two children.